The story of the creation of the original rainbow flag from San Francisco’s Gay Freedom Day Parade in 1978 tends to credit American artist and gay rights activist Gilbert Baker as the sole creator and designer of the colorful flag that would become an international symbol of LGBT pride, LGBT rights and LGBT Freedom, however, dye artist and designer Lynn Segerblom, has a different tale to tell. She’s come out of the dark to set the record straight about two missing flag makers who she says Baker wrote out of the rainbow flag history. According to Segerblom, who went by hippy name Faerie Argyle Rainbow in the late 70s, the birth of the original rainbow flag had a mother (a young Faerie Rainbow) and two dads (seamster James McNamara and yes, Gilbert Baker). She says the glorious moment when two giant 30x60ft rainbow colored flags and several smaller versions debuted at the Gay Freedom Day Parade in 1978, never would have happened, were it not for the tireless efforts and skills of clothing designer James McNamara, as well as her own fabric dyeing and designing techniques. There was also an army of volunteers and artists who gathered at the Gay Community Center, a three-story building, on 330 Grove Street, to work on the flags. 40 years have passed since the rainbow flag was conceived. The Gay Community Center where it was created has been demolished to make way for a parking garage, James McNamara died from complications of AIDS in 1999, and Gilbert Baker died of hypertensive heart disease in 2017. Segerblom reunited with Glenne McElhinney, a historian who was also a member of the parade committee in 1978. 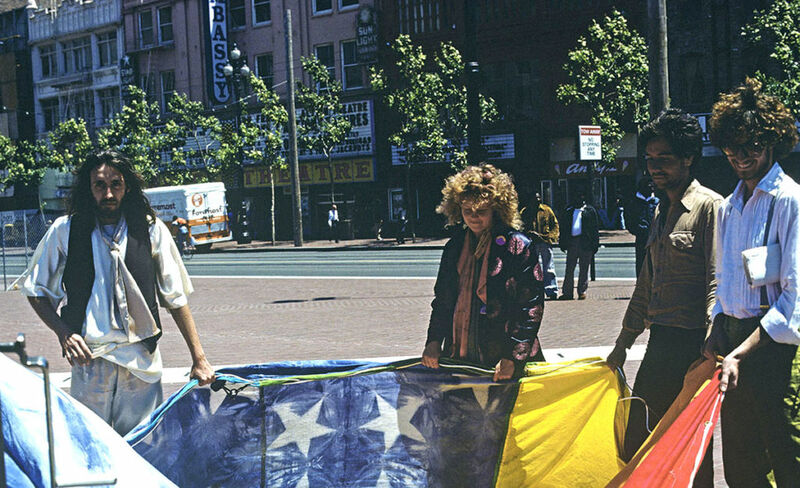 McElhinney is making an upcoming documentary about the original rainbow flag with the help of Paul Langlotz, a Larchmont marriage and family therapist, who also witnessed the making of the giant banners. The three are sharing and comparing notes about how the rainbow flag came to be at the Gay Freedom Parade for documentation. Segerblom has been busy during the 40th anniversary of the original rainbow flag. 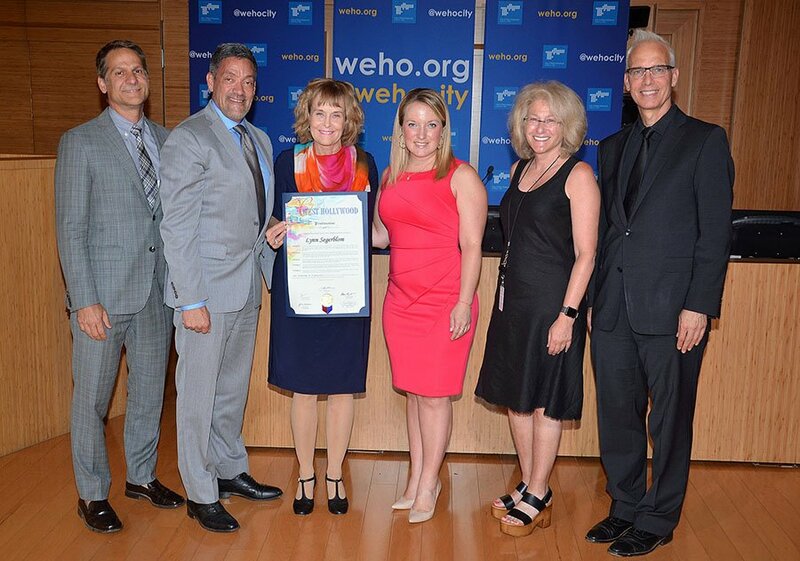 She recently received a proclamation from the City of West Hollywood for her contribution to LGBT history. She spoke at a One City One Pride panel in West Hollywood during Pride Month in June. She was featured at the San Francisco Pride Parade 40 years after she marched alongside the original rainbow flags she helped create. And she’s scheduled to be in this year’s Palm Springs Pride Parade in November. 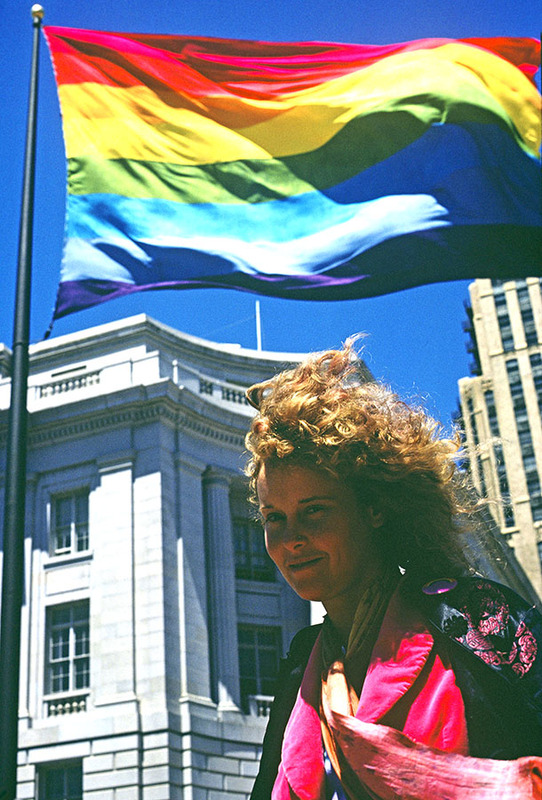 In an interview with WEHO TIMES, Segerblom speaks of how her love for rainbows goes way back before the birth of the original rainbow flag (she loved the rainbow so much, she named herself after it). 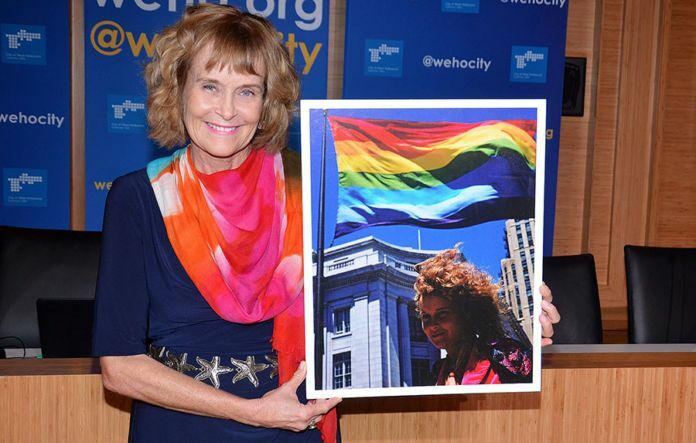 The 62-year-old resident of Torrence California, breaks down why many of us are just now learning about the role she and James McNamara played in LGBT history, but she also gives Gilbert credit for being the mouthpiece for the rainbow flag. She says his promotion of the flag was key in elevating the rainbow to the powerful LGBT symbol it is today. I’m originally from Hawaii. From the North Shore of Hawaii. I went to art school at the Academy of Art. I got a little summer scholarship. I won that twice in a row. Finally the second time, my mom let me go with my girlfriend—best friend. How do you identify sexually these days? I’m straight. I have been for years, but back then, everyone was experimenting. When I came up to San Francisco, I had no sexual ideas, experience—I didn’t know anything. I was like duh. 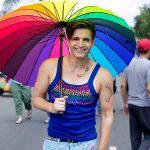 Why do you think some of us queers are barely learning about your place in LGBT history? You know, James Mcmanara and I were just written out of the history of the rainbow flag, when—to be perfectly honest—if it wasn’t for James’s expertise in sewing and patterning, those flags would have never been completed in time. He’s the one that taught Gilbert Baker how to sew. James went to FIT [Fashion Institute of Technology]. He was an amazing pattern maker, sewer, tailor and photographer. Those photographs that you’ve seen since March, that no one had seen before—they were all taken by James McNamara. He passed away from AIDS. That is why you haven’t heard from him. As for me, I did move out of town. I was in San Francisco for almost two years and then I traveled abroad and I moved to Los Angeles. When I was living in San Francisco, I made the jump over to Marin County. That was after Harvey Milk and Mayor Moscone were shot dead and then the Gay Community Center was torn down and made into a parking lot. Did you move out because Harvey Milk had been shot? That was the catalyst. We were obviously in the 1978 gay parade. That was the year of the hand dyed flags. It was the first time they had ever been flown. We were part of the parade committee. That was the only year that I marched in the parade in San Francisco and that was also the year that Harvey Milk was in the parade in San Francisco. You had a different name back then. What made you adopt the name Faerie Argyle Rainbow? It was a crazy name (laughs). Many people back in those days had crazy names. I knew a girl named Sugar Bear. I was friends with this lady, her name was Bethany, the Princess of Argyle. She had a children’s theater group, which I joined when I was 18 years old. She named me Faire. I took the name argyle, because she was The Princes of Argyle and I loved rainbows. I had a driver’s license that said Faire Argyle Rainbow. You could just tell them that was your name and they would make you a driver’s license. People were less suspicious back then. I filled out the form and said this is my name. I took the driving test and I got my driver’s license. At what point did you decide to go back to your government name? I’d say it was 1980 or ‘81. Why did you decide to come out of the dark and stake your claim in LGBT history? Glenne McElhinney, who is doing the documentation of this whole thing, she worked on the rainbow flags with me. She helped pull the dyes and rinse them. She contacted Paul Langlotz and he contacted me. 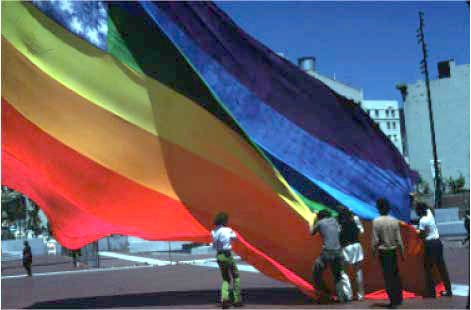 Paul Langlotz was also there at the original making of the 1978 rainbow flag. He was just hanging out. He was friends with Gilbert and James. He got Glenne McElhinney and myself together in 2012. She reminded me of who she was back then. I remember her. She had really long dark hair past her waist. So you did the dyeing of the rainbow, James did the cutting and sewing, and Gilbert Baker designed and promoted the flag? Gilbert did some sewing along with James. After all the dyeing was done, I did some sewing too. We had three sewing machines. Each one belong to each one of us. Gilbert is good at promoting. He took up the banner of promoting. At first he was sticking to the story that there were three flag makers and a lot of volunteers, but it gradually changed. Do you believe there was malicious intent on Gilbert’s part? No. I don’t think that. I don’t think it was malicious. I think he was offered money to confirm the rainbow flags and that was just it. He couldn’t resist. He was always good at maybe stretching the truth, or embellishing. He was very drag queenesque, which was a charming part of him. I don’t think it was malicious. I think the story began to tumble. He added a few extra things. He delete a few things. And pretty soon, the snowball gets bigger as it rolls down the hill. And if money comes into the picture, there you go. It became his whole life. He worked really hard to promote, not just the flags, but himself as a promoter of the flag. When you’re really poor and literally hungry and people offer you money, are you going to say no? He did a great job in promotion and propagating, but he strayed from the truth. The color of the rainbow scheme—I came up with that, but whatever. We can say all three of us came up with it. I know we had a meeting about this. He and I were in the decorations committee, but without James, I cannot say enough, how they would not have been sewn as well or been on time. If you went back, I’ve got color photographs from 1976 and ’77 of the costumes I made when I was Faerie Argyle Rainbow and you’ll see a rainbow on the clothing. I think I started that in 1976. I took up space in the 330 Grove. The Rainbow was already at the Gay Community Center. I was dyeing things and often the rainbow scheme was a great part of the things I made. 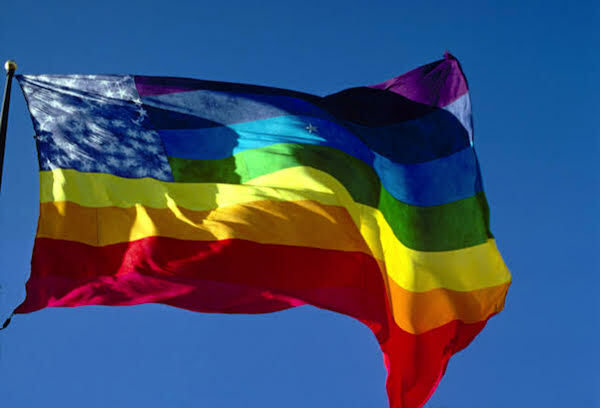 When you created these rainbow flags, did you have any inkling that it would become the symbol that it is today? No. I don’t think any of us did. What do you think the Rainbow flag symbolized in 1978? I know on that day of 1978 in June–I think it was June 25, 1978. It was a big deal. People just loved them. We were stunned. It was so hard. It’s not just the two big flags that were 40×50 feet. There were all the reflecting flags that were designed by—each one of the white muslin flags was given to one artist at a time. It would already be cut, so it was up to you to paint it, dye it, applique it—do something to it and we need it for the reflecting pole. I believe we counted about 18 flags. The reflecting pole is no longer at the Civic Center, but it used to be in 1978. There were a bunch of smaller flags too. It was quite a project. Where was the Rainbow flag in LGBT history at that point? Was it already a symbol for something related to gay rights? No. It wasn’t. We brought it in. That was the first. The year before ’77, they had flags—smaller ones, but they had flags in their parades. Glenne McElhinney has photographs from the 1977 parade with the banners that people carried. There were no rainbow flags that year in ’77. At what point did you realize the rainbow flag you created become this symbol in the LGBT movement? It was some time in the 90s. Or late 80s. I lost track. Once we lost our center at 330 Grove, we lost track of people. Then people started dying. No one knew what it was. The term AIDS hadn’t come around yet. They were calling it gay cancer. It was a horrible time. Really dark. It was also a lot anti-gay sentiment. There was a lot of hate. It was terrible. I think it was 2003 when I had moved back to Los Angeles and I attended a gay parade in L.A. that I realized they were so loved, appreciated and taken to heart. You were in this year’s San Francisco parade 40 years after your rainbow flags debuted at this parade. What was that like? It was a really a great day. I drove up by myself. I stayed at my girlfriend’s house who I known for 40 years. I went into town using BART (laughs). I hadn’t used BART in years. It felt like 100 years. It’s a great way to get into town, I’ll tell you. Glenne McElhinney had organized all of this. She had made all these signs against Anita Bryant, Stonewall and there were a bunch of us. There were two convertibles. A woman named Carol from the 1978 committee sat with me. It was a real pleasure to meet her. I do remember her from back then, I do. I haven’t seen her since 1978. We were going down Market Street and I can’t believe how big the city has gotten. The people were so happy and friendly. They were yelling out for us as we went by. People were dressed in rainbows. It was a joy to see this. A joy. After we went over to the Civic Center and saw a good portion of the show they had lined up. I really enjoyed that. And then I took BART home (laughs). By the time I got home that evening, I was exhausted, but it was a terrific day. I loved seeing all the young people that were all rainbowed out—old people, young people—everybody. There were people with different flags from different countries and the were rainbowed out. Some people were yelling thank you. It was such a pleasure. I understand you’re going to be in the parade at Palm Springs right? Yup. I really like Palm Springs and I knew there’s a strong gay community down there, which I’m really glad. I spent some time there as a teenager with a girlfriend, just because her parents had a house down there. I liked the area. I thought it was beautiful with the mountains and the desert. I’ve never been to the parade down there. When was the last time you communicated with James McNamara? It’s really sad. I’m sorry I didn’t see James before he died. He went back to New Jersey. That’s where he’s from. Paul Langlotz went with him. I was not in touch with them at this time. I don’t even know if I was in the country. It was just really sad. I saw him sometime in the 90s. He passed away, I believe in 1999, but he was sick for a while. What about Gilbert Baker, when was the last time you saw or spoke to him? Gilbert Baker I did see in the parade in 2003. He jumped out and gave me a hug. It was a warm greeting and everything. We thought we’d see him after the parade was over, but we didn’t. I don’t know, there are thousands of people. It’s LA. He was literally in the parade, so he jumped out of his car and gave me a hug and that’s the last time I’d seen him. Was there any animosity between you and Gilbert during that time? No there wasn’t any animosity, although I must say, I was shocked. James said he was terribly hurt that he was never credited with the making of the original flag in 1978. You don’t know what a big mess it was trying to dye 1000 yards of cotton muslin. It was a huge mess and we needed helpers. I could not be done by one person. There is no way. Just to carry one of those flags, you need two or three people. When it is folded up, it weighs so much. Greg Day brought us some pieces of an interview from 1981. In that interview Gilbert was quoted as saying it took many people, many volunteers to make the first set of rainbow flags. It wasn’t one person. This was in 1981. He was still giving credit and not saying it was only him. So you’re basically the mother of the Rainbow flag that LGBT people don’t really know about? Yes. It’s true. It’s ironic. In the beginning I was like wow, I’m so glad; at least it’s out there. People love it and it’s being promoted. Now I hope history is corrected. Charley Beal, manager of creative projects for the Gilbert Baker Estate, told the Los Angeles Times that Baker come up with the idea for the rainbow symbol but that he was always “effusive with credit” for those who helped create it, especially in a soon-to-be-published memoir. Don’t miss Lynn Segerblom at the Palm Springs Pride Parade, for more information, visit https://pspride.org/.